Popped in one lunchtime as had heard some fairly good reports but was very, very disappointed. It was, in our opinion, over priced for the light lunch we ordered, the service was very slow considering there were not that many customers, and the staff appeared totally disinterested. Shame as I'm sure that run properly it could be an absolute gold mine - not for us though! Often ride past The Victory as I cycle home from work. Seems to be very popular of a weekday evening. Visited it for the first time in ages last Friday. Had the Harveys. Well kept pint. Emphasis is clearly on food these days but that is where the money is so who can blame them, and what I saw looked pretty good. The restaurant was doing a roaring trade whilst my wife and I were the only people in the bar. Clean bright interior and lovely staff. 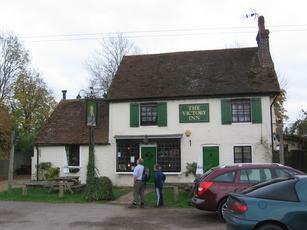 Have visited The Victory on several occasions and been glad that I did. Service has been pleasant, prompt and attentive even at popular times, customers and staff look happy. The food has been honestly prepared, vegetables plainly but freshly cooked, adequate portions and prices are reasonable. Harveys Sussex and Sharp�s Doom Bar are available and well kept. Access is convenient and parking is good. The location is convenient but quiet and overlooks the village green. There is outdoor seating in a rear garden or in front of the pub. Consistently good � recommended. Fond memories of this being my local in the 1980's: it had bar billiards then and the best jukebox for miles. Nowadays more of an eaterie, but not much else has changed, particularly the gravelly car park ! We were searching for a place to eat a late lunch on a Sunday and we passed the cricketers on the green at Staplefield and saw The Victory at the edge of the pitch. The idyllic surroundings were made even better by the excellent service and delicious food. The staff was cheerful and talkative and all five of our meals and puddings were very good. Steak and ale pie, crispy fish and chips, Thai noodles with perfectly cooked king prawns and huge bowls of moules...followed by tarte tatin, coconut pannacotta, chili chocolate cheesecake. We are disappointed that we didn't discover this pub earlier. We sat at picnic tables to watch the cricket but the inside was nicely furnished and cosy. We will be back.